Robert William Benson, was born in Frizington, near Whitehaven, Cumbria on 9th February 1883. Coming from a mining family he later found himself in the North East, presumably his father moving with the work, when he began playing for junior clubs such as Shankhouse and then Shalwell. He worked as a steel moulder in Gateshead before signing as a professional for Newcastle United in late 1902. He appeared once for the Magpies in a match against Liverpool, and left for Southern League Southampton in September 1904 for a fee of £150. 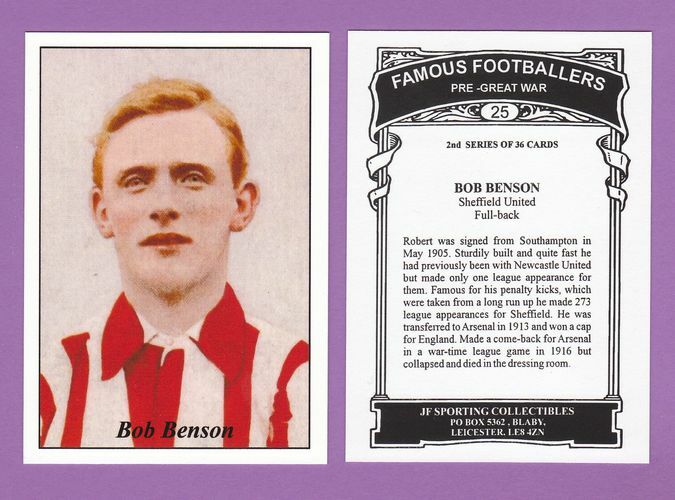 He played 22 times for the Saints and after a number of injuries and failed penalty attempts he left after one season for First Division Sheffield United in May 1905 for £275. He stayed at the Blades for eight years and improved his penalty performance, scoring 20 penalties during his 283 appearances. 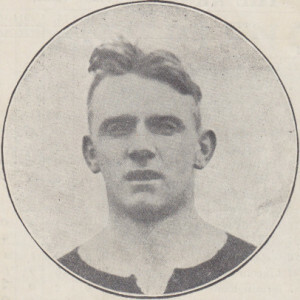 During his time at Sheffield his impressive performances ensured he received one full England cap in an international against Ireland in February 1913. Earlier in 1910 he played in three games on the F.A. tour of South Africa. Benson joined Woolwich Arsenal on 18th November 1913, and his first game for the club was away at Bristol City on 29th November, in a 1-1 draw in front of a crowd of 15,000. Bob, a full back who normally played for Arsenal at left back, played at centre forward for the last League match of the 1914-15 season. It was his last full first team game for Arsenal, and he scored twice in the 7-0 win at Highbury in April 1915. It was also the last game Arsenal played outside the top flight of the English League. The Football League was then suspended for the First World War, but in order to provide some entertainment for those still in the country, football was played on a regionalised basis and the London Combination was founded in 1915. Normal rules of registration were abolished and players played where there was a vacancy and a game. Bob Benson worked at the Royal Arsenal Ordnance Factory during the war, serving the country in Plumstead making the munitions for the soldiers at the front, working shifts of up to 16 hours a day. Additionally, fellow Arsenal players Joe Shaw, Jock Rutherford, George Grant, Angus McKinnon, John Flanagan and Alfred Fletcher were all engaged there, as was former Woolwich Arsenal manager, and trained engineer, Phil Kelso. On 19th February 1916 Bob went to a London Combination match between Arsenal and Reading at Highbury. He convinced one of the Arsenal players to let him play in his place, although he had not played at that level since that match against Forest. After about an hour’s play Benson walked off the pitch telling trainer George Hardy that he felt “a bit stiff in the legs”. He collapsed in the changing rooms and died a little later of a burst blood vessel at the age of 33. It is said he was buried wearing his Arsenal shirt, and a benefit match was held for him in May 1916 against a London Football Combination XI. 5,000 turned up to witness a 2-2 draw with the proceeds going to his widow Jean and daughters Edna and Ena. Additionally, many clubs donated money for his dependents including Manchester City, West Ham, Lincoln and Luton and reports at the time said over £400 was raised in his name. In all he played 54 League and FA Cup games for Woolwich Arsenal over the two Second Division seasons and tallied seven goals. 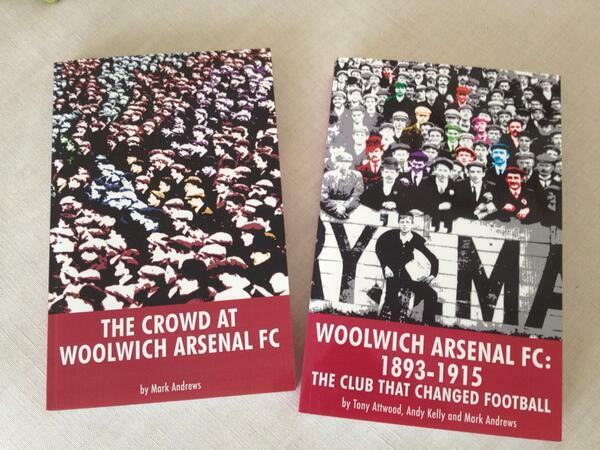 Bob also scored the last ever Woolwich Arsenal goal in a reserve game against QPR on 29th April 1915.